There are a lot of decluttering myths about what it takes to live an organized, tidy life. The recent popularity of Marie Kondo’s The Life-Changing Magic of Tidying Up: The Japanese Art of Decluttering and Organizing book only seems to have muddied the waters regarding clutter even more. The Japanese organization guru presents some radical concepts about decluttering in her book. Most famously, she preaches that any item you own that doesn’t “spark joy” within you should be discarded. Well, Kondo’s book was a #1 New York Times Best Seller and is currently being turned into a Netflix series. Surely, she has all the answers when it comes to the best practices to follow related to home organization, right? There’s more than one way to declutter and get a space organized. Decluttering methods and practices that work for one person aren’t going to work for everybody. Let’s look at 7 common decluttering myths and the actual truth behind these misconceptions. The truth: Accumulating clutter (even on a small scale) is an inevitability in life, regardless of how tidy a person you are. Being completely organized all the time simply isn’t realistic or practical. Sometimes you’ve had a long, stressful day and just need to relax instead of tidying up. That’s okay. Give yourself a little leeway and make an effort to tackle your cleaning chores the next day. Your batteries will be recharged and you’ll probably do a better, more efficient job with your organizing tasks. The key is find a schedule and routine that allows you to maintain a tidy home without feeling burnt out or burdened by the need to declutter. Impossibly high organization standards will only lead to frustration and disappointment. The truth: Decluttering needs to be a regular, ongoing process. Investing hours into a major decluttering project will liberate you from the oppressive, chaotic feeling that comes with living in a cluttered home. Taking action to curb the clutter is a good first step, but it’s just that –a first step. An annual concentrated decluttering effort just won’t cut it. Having a regular decluttering routine is the only way to maintain a consistently tidy home. Try to allocate time to handle this task on a weekly basis. Once per season, devote a little more time to your decluttering and cleaning duties. The truth: Sometimes it’s about what’s not there when it comes to the impression a room can make. Perhaps it’s the negative connotation of the word “empty” that makes empty space seem like a bad thing. Some interior decorators even borrow a term from the world of art and refer to spaces in the home intentionally not occupied by furniture or, say, artwork on the walls as “negative space”. No wonder the concept gets a bit of a bad rap – “negative” is right there in the actual name. Decluttering isn’t just about cleaning up and getting rid of junk. It can also be about making a calculated decorating choice to keep a space (or spaces) empty. That serves a couple of purposes. First, a less “busy” space can be calming and not as overwhelming to our brains. Keeping spaces empty also allows other features and items in the room to be accentuated and draw our attention. “Clutter” doesn’t just mean stacks of useless junk. It can also refer to filling corners or walls with too many things, like furniture and artwork. 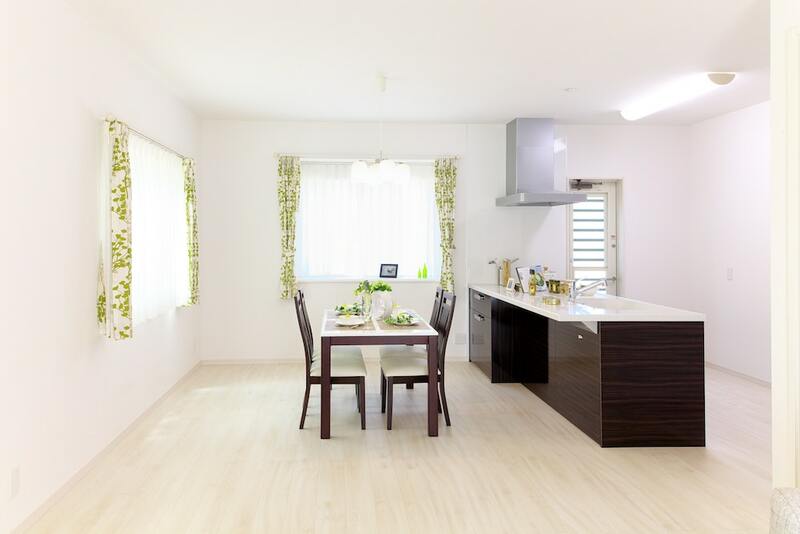 This room’s deliberate use of empty space accentuates its table and island. The truth: It’s not for everybody. One of the more common decluttering myths is that embracing a minimalist lifestyle is the way to go. Kondo’s book and numerous media articles telling us to re-examine our consumerist tendencies have caused more and more people to learn to live with far fewer things. Drastically downsizing and living in a micro condo, tiny home, or 200 square foot shipping container apartment definitely isn’t everybody’s idea of enjoyable, though. Owning more things than you really need doesn’t make you a worse person than someone living a minimalist lifestyle. It’s simply a personal preference. Just try not to go overboard with how much you buy until it gets to the point where you’re drowning in clutter. As the saying goes, “Own your stuff, don’t let your stuff own you”. The truth: This is one of the decluttering myths to which we say “rubbish”. Being well-organized isn’t a trait or characteristic – it’s a skill. And any skill can be learned and developed over time. It all comes down to a person’s willpower and patience to develop that skill. Granted, it will definitely be a real challenge to get an older person who’s been untidy their whole life to suddenly make a 180 degree turnaround and become a neat freak. Insert any number of expressions here…“you can’t teach an old dog new tricks”, “a leopard can’t change its spots”, etcetera. But you can change. Otherwise, expressions such as “if you’re not learning you’re dying”, “if you’re not learning you’re not growing”, and “if you’re not learning you’re not living” (and many other words of wisdom about learning) wouldn’t be part of our lexicon. The truth: There’s a lot of great organization helpers available out there. Take advantage of them. One of the decluttering myths out there is that you can capably keep a tidy home without investing in quality organization and storage systems. Sure, it’s possible, but why make it so difficult for yourself? 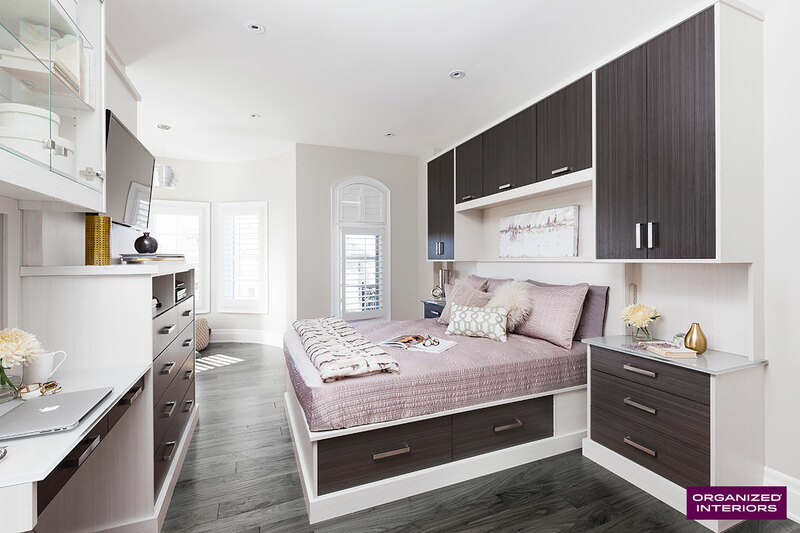 There are plenty of amazing products out there like closet organizers and bed surrounds that are specifically designed to maximize storage space and save you time by making it easier to stay organized. These effective tools won’t do all the work for you in terms of staying organized, but they certainly make it a lot easier to do so. Take advantage of the many great products out there (like this custom bed surround) that help you to stay organized with less effort. The truth: Yes, one can technically live a disorganized life and just adapt to the clutter that surrounds you. Unfortunately, the longer you don’t deal with your clutter, the more unmanageable your life will become. Think of how much time you waste every day searching for things in a home or office that’s not organized. One recent survey estimates that the average American spends 2.5 days every year looking for lost items. The average search time spent looking for a single lost item was almost five-and-a-half minutes. On top of the wasted time clutter causes, it’s been well-established by medical professionals that having too much clutter can contribute to stress, poor sleeping habits, and other medical issues. Don’t be mislead by the many decluttering myths that are out there. The truth is, everyone needs a hand occasionally when it comes to keeping their life and home organized. Organized Interiors is all about helping our clients make space for living, not living around the clutter that’s congesting their homes. We have effective storage and organization systems for every room in your home, so book a free in-home design consultation with us today.